The Secretary of State for Northern Ireland, the Rt Hon Karen Bradley MP, has signed the Heads of Terms for the Belfast City Deal, alongside the Belfast City Regional Deal partners and the Northern Ireland Civil Service. 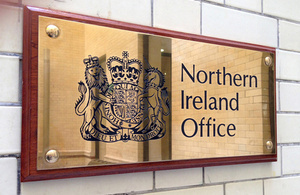 This is a major milestone towards the completion of the first City Deal for Northern Ireland. The Belfast Region City Deal will see the UK Government invest £350 million into the Belfast Region over the next 15 years. It is proposed that this figure will be matched by the Northern Ireland Executive once the devolved institutions are restored. "I am absolutely delighted to sign the heads of terms for the Belfast City Deal. "The UK Government has committed £350 million of funding to support and encourage economic development across the region, creating jobs and boosting prosperity. "I am also engaging closely with the Chancellor to secure a financial announcement for the Derry-Londonderry Region City Deal and help unlock the huge potential that Derry-Londonderry has to offer. The UK Government is committed to developing a comprehensive and ambitious set of City Deals across Northern Ireland and delivering a stronger economy that works for everyone." It is hoped the deal will see the delivery of more than 20 projects to help create up to 20,000 new and better jobs alongside an increase in productivity levels, as well as having a positive impact on the most deprived communities, delivering a balanced spread of benefits across the region. "The signing of a Heads of Terms for the Belfast Region City Deal is a significant milestone in our journey towards substantial investment in inclusive regional regeneration. "It’s testament to the power of collaboration and partnership and we look forward to progressing plans with our wide range of partners, including our colleagues working to deliver a programme of investment for Derry-Londonderry and the North West region. "This is an investment which will improve quality of life for people living here and further enhance our attractiveness as a destination of choice for investors, visitors, new residents and students alike." "This is tremendous news for the communities and businesses living and operating in the Belfast City region. "This transformative deal will bolster innovation, productivity and prosperity across the region, and I am delighted to see the hard work which has gone into this deal come to fruition." For more information on the proposed programme of investment, click here. You can also follow #BRcitydeal on Twitter.